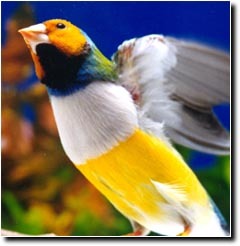 ladygouldianfinch.com - Preening & Bathing life or death function? "...when I added KD to my birds weekly baths I say a dramatic increase in bathing as well as a total evolution of excitement and loudness in the birds." Bathing and preening are important functions in maintaining birds' feathers. If the feathers become damaged, birds will not be able to fly, escape from predators or search for food. Birds spend a good part of their day preening their feathers. Sometimes they will even preen other birds. Preening is an important part of their daily routine and is necessary to maintain optimum feather health. Preening removes dust, dander and debris from their feathers. Preening keeps the feathers in good condition to help the bird stay warm, clean and able to fly well. During preening, the bird gently nibbles along the barbs of each feather, starting at the quill and working towards the tip, making sure they are properly arranged. 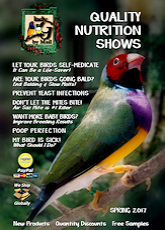 Healthy birds will do a great deal of preening; a sick bird will preen very little or not at all. This will be obvious by its poor feather quality. In addition, most birds have an oil-secreting gland called the preen gland (uropygial gland) underneath their tail (� in the species that possess one.) Birds rub their beaks against the gland and then spread the oil over the surface of the feathers. This oil waterproofs the feathers and keeps them flexible and also acts as an antibacterial coating. 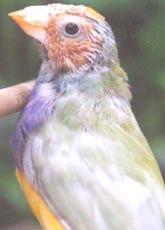 Some birds are poor preeners, and others may over preen feathers; both extreme behaviors contribute to abnormal feathers. However, preening is not always enough for birds. They will find places to bathe to really stay clean. Depending from where a bird species comes, and its own personal preferences, bathing can be an important part of a bird's life. Some birds come from the dry Australian outback, so bathing is done infrequently. In contrast, some species come from wet environments and love to bathe. In captivity, many birds follow their wild instincts. Some birds need to observe other birds bathing before trying it themselves. Some birds should be offered a bath or be misted every day, while others won't like to bathe at all. Birds vary greatly in the ways they like to bathe. Some birds like a bowl some like the shower; others like being sprayed with the fine mist of a plant mister bottle. Birds that enjoy being bathed will ruffle up their feathers, flare their tails and hold their wings out and some even chirp and sing as they bathe! How often should I bathe my bird? Many birds bathe daily in their natural habitats. If you have the time to permit your bird to bathe or shower each morning, it can be part of your daily routine. If your busy schedule doesn't permit this, a bath once per week will be beneficial, especially during the molt. Bathe your bird during the warmest part of the day, making sure the feathers have a chance to dry completely before nightfall. Make sure the water is a comfortable temperature. Most birds prefer their bath water to be lukewarm or room temperature. Normally clear water is sufficient. Commercial soaps and shampoos that are not designed for birds can remove essential oils that protect the feathers and skin. 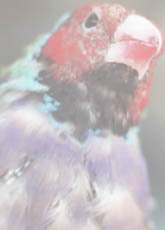 Soap residue left on the feathers after rinsing may also harm your bird. 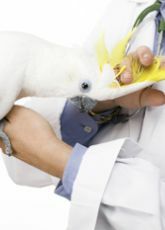 In our bird�s world where we�ve introduced lipstick from kisses, newsprint ink, hand oils and a variety of other messes, we recommend shower shampoos to do the clean up job for the larger birds. These shampoos are specifically formulated and pH neutral to limit any negative effect. They are alcohol free, with natural botanicals and surfactants that don�t strip down personal oils close to the skin. The shampoos recover the natural brilliance of feathers. They have been used for years by groomers, nurseries and breeders with amazing results. It is fine to take the bird into the shower with you. There are perches designed to be used in the shower that use suction cups to secure them to the tile walls. The smaller birds like finches and canaries that normally do not come out of their cages a small dish with slightly warm to cool water placed on the bottom of their cage is the best method. KD water cleaner can be mixed with the bath water as an insect repellent and feather cleanser, repelling red mite, quill mite, scaly face mite, flies and lice. The KD mixed in water can also be placed in a clean spray bottle to create a fine mist for the larger birds. Never saturate your bird's feathers. In the wild birds never allow their feathers to become completely soaked. This can lead to flight impairment. In species native to extremely warm and humid climates, (tropical rain forests) using a daily spray helps to re-hydrate their nasal cavities as well as clean their feathers. How do I get rid of my bird's dandruff? Birds do not have dandruff. Cockatiels and Cockatoos can be "dusty" birds, meaning they produce large quantities of powder from a specific type of feather, called powder down. Powder down comes from special feathers that are designed to disintegrate into a fine dust which Cockatiels, Cockatoos, and African greys use to waterproof and condition their feathers. Hyacinth Macaws and Amazon parrots (two parrots that don't possess a uropygial gland) still repel water. Feather sheathes that cover the growing pinfeathers and flake off as the feather matures can also be mistaken as dandruff. Daily misting with a spray designed for powder based birds will help keep the powder under control. Many birds have not been conditioned to accept bathing, despite the fact that daily showers would be a part of their natural grooming activity in the wild. Take your time and experiment with the different techniques; Shower, Misting or taking a dip in a container of choice. You will find one that works for your feathered friend.